Proof that excellent, craft, and cheap can come together in one product. Sadly not often, but with this rum it does ! Notes: Made in one of the few copper Bordeaux Alambic type potstill in this country this country, this rum is also distinguished by using 100% Hawaiian molasses ( making it one of the few worker cruelty free molasses rums along with Panamanian rums) and one of the few American made rums ( Yes, I know, but most of the other US made rums are made in territories not states except for a precious few). Until recently there were strangely no rum distilleries in Hawaii (with sugar cane, great water and cost of shipping in imports you would think they would have before now. Sergeant Classick was set up to to use 100% Hawaiian molasses to use this great resource on some more affordable real estate where it would not cost an arm and a leg to get it shipped to the mainland. We have a review of their unaged ( and fresh from their still Silver Rum here . 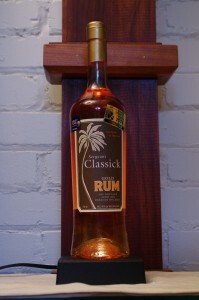 First Impression: Strong molasses, pineapples and sweet fruit notes with classic brown sugar creamy notes of rum. Drinks: We used it in a number of classics and it held up well. With its superior balance, clean finish and slightly dry nature it reinvigorates the classic cocktails and keeps the new ones from suffering from an overabundance of sweetness. Bottle: Clear glass, somewhat cylindrical but with a slightly flared bottomed a softly rounded shoulder making it a good bit more distinctive than most.Somewhat muted but attractive graphics on a paper label of good quality with clipped edges.Back label has story about the founder and his journey into rum.Nicely done attractive and unlike most easy to read for those over 30 years old.Shrink wrap bronze gold neck capsule and Embossed design on top with no pull tab and a slightly thinner than normal bar topper with synthetic cork closure make it a bit of a challenge to get open, so plan ahead and open two if it is going to be that type of evening. Other: The copper lambic still they use is a rare and unique type of still of which only 2 are known of in their country. A somewhat minimal but well laid out website with some pictures and backstory.